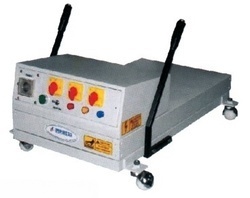 Prominent & Leading Manufacturer from Mumbai, we offer table dryer. This automatic far infrared dryer which moves on manual printing table is suitable for heating printing paste and ink on clothes. Using carbon fiber heating tube, highly efficient, energy-saving and long using life. Advanced designed temperature control system, high precision and easy to operate. Stepless speed change, automatically going back and forth. Precise position, one button matching along with one heating tube. Automatically pausing, cutting down the supply and alarming when fault happening. Nice drying effect, even can dry heat-set printing ink. Looking for Table Dryer ?